TBILISI, DFWatch–Groups in Georgia on Friday launched a petition demanding to punish the person who was recently acquitted of murdering a transgender woman in Tbilisi on the grounds that he was acting in self-defense. The organization Women’s Initiatives Supportive Group is behind the petition, which in one day collected over six hundred signatures. 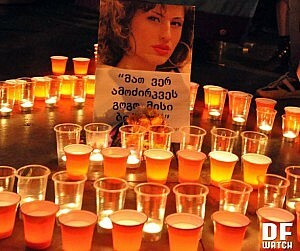 The explanatory note of the petition says that even though the court determined that the accused, Levan Kochlashvili, stabbed Sabi in the chest, set fire to the apartment and ran away from the crime scene, he was only sentenced to four years in jail, but that was for having beaten another transgender woman the same evening and for damaging property. The court found that Kochlashvili had acted in self-defense in the confrontation with Sabi and consequently he was acquitted of murder. The conviction for battery was concerning an incident the same evening as Sabi died, but the victim was not her, but Bianka Shigurova, who has told journalists she has been attacked many times, including on the day when Sabi died. She claims that the man who visited her physically offended her. She recalled that she had a conversation with the man via Internet, after which she invited him to her place. The man attacked her, and Bianka believes that the man murdered Sabi the same day after he had been at her place. Bianka claims the assailant used electro-shock and threatened to kill her if she spoke out about the incident. “Transgender people are the most vulnerable people even within the LGBT community and are a marginalized group. They are permanently persecuted, harassed and a target of violence,” the note reads, adding that the number of murders of transgender people globally is very high. Signatories of the petition want the Prosecutor General’s Office to appeal Tbilisi City Court’s decision based on obvious signs of a hate crime because of the gender identity or sexual orientation of Sabi (previously known as Beka Beriani).